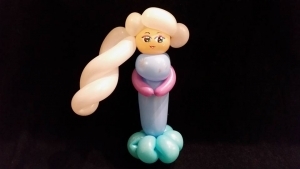 A modeller will happily produce a balloon dog which just about passes look-wise but then it untwists shortly after the happy child receives it. They cry. The parent gets angry. The balloon modeller is too busy twisting a yellow balloon into a ‘Giraffe’ to even notice this! Everyone can tell that this is simply the same as the dog – only made with a yellow balloon and a long neck! Balloon modellers produce simple balloons and are therefore usually hired cheaply for events. They are good when a client needs a fast supply of balloons made ready to be handed out to children. However, most of all, they just make for an ‘OK’ type of feel. You will lack real value from a simple balloon modeller. A balloon artist ensures that people can watch in amazement as they carefully but speedily create an easily recognisable animal. Almost always the sculpture includes different coloured balloons – often even different sized balloons, adding depth and detail. The balloons are solidly created and don’t twist apart like the other balloons can. They genuinely make people say, ‘ahh’ and ,’ooh’ as well as the classic line, ‘I didn’t know people could do this sort of things with balloons’. This means that people can connect with your event much quicker. Balloon artist’s work is far superior to balloon modeller’s work. A Balloon artist adds huge value to an event as people remember seeing them and they tell thier friends about the event where they saw all these amazing things at such an event (which included this amazing balloon artist). Ask yourself the question, ‘Which type of service would I prefer at my next event? A modeller or an artist?’ One of them will give you far greater value than another. It will help people to remember your event and they will compliment you on organising something with such a unique and amazing feature. Want to see some of Nick Twist's other work? Where can you use a balloon artist? Balloon artists are very versatile entertainment choices. The first which always springs to mind are children’s parties. This is an excellent choice, but there are many more. For example, corporate events can be made far more fun by having a caricature balloon of the chief CEO in the entrance hall or on the stage – what a talking point to lighten the mood of such an event! Nick Twist produced caricatures of two famous politicians for the running up to the EU Referendum. Click here to see them! Then there are weddings. Children love balloons and weddings, being such long days, can become boring for children. So you need something to lighten their mood. 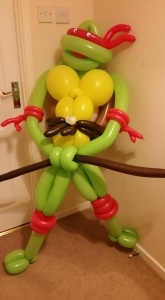 Some outstanding balloon art made in front of their eyes gives them so much fun – not to mention fun for the adults who watch too! Adult parties are beginning to include balloon artists too. Perhaps an hour of fun balloon art can really liven up the party for your guests. Don’t be fooled into thinking that balloons are only for children. Women love the princess balloons and the men enjoy wearing wacky balloon hats. Store openings or promotions lend themselves well to balloon artists. Having a child walk out of such an event and carrying it around draws huge attention to your event. Parents will be asking, ‘Oh wow! Where did you get that?’ They then pile right into your store! So you can get value at your event by hiring a balloon artist for a few hours, You would probably not get this value with a balloon modeller. They will simply make a little dog and this won’t attract enough attention to your event. 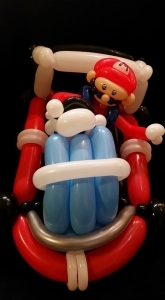 A balloon artist can create ‘wow’ balloons! A balloon artist’s impression of a famous movie star! Finally there are exhibition balloons. Huge, stand-out balloons which draw huge attention. Just like mentioned above, this type of feature gets people talking about your event. They smile, take photos of themselves with it and spread YOUR event across social media! How powerful is that? You don’t get that value with a balloon dog do you? 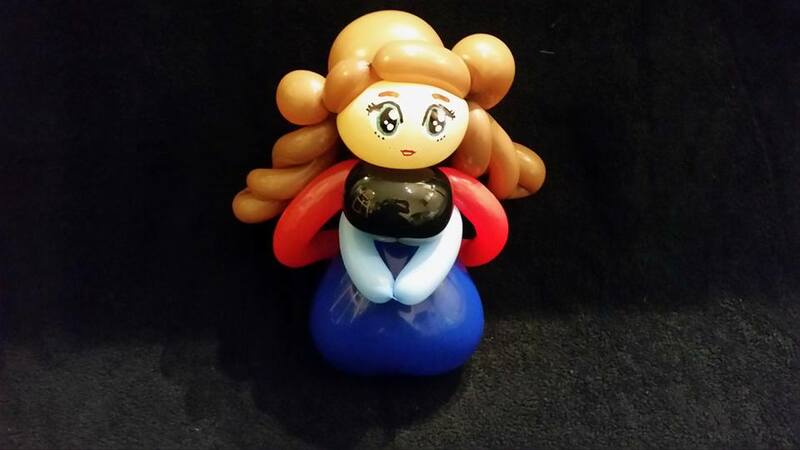 Balloon modellers and artists basically offer the same end product – a balloon. But that’s not necessarily the point in hiring someone to entertain with balloons. You need an artist to serve huge value and get people talking about your event. You need unique and exciting balloons to wow your guests. Rarely can a balloon modeller tick all of these boxes. If your hire a balloon artist, you know that you are in for a treat! Have fun! See you next week. By the way; the balloons seen on this page were all created by Nick Twist, one of East Anglia and London’s leading balloon artists. Click below for more information on Nick Twist. Want to see what services Nick Twist can offer to you? I want to see how Nick Twist can add value to my event!